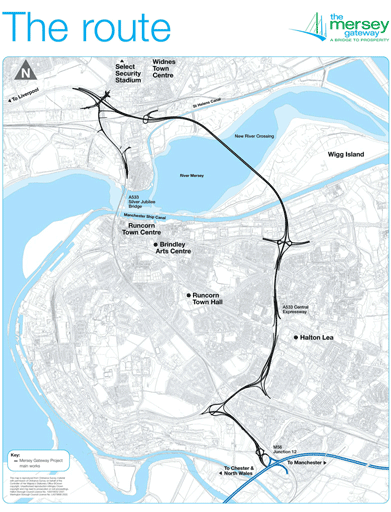 The route of the Mersey Gateway will run from Junction 12 of the M56 in the south to the A562 Speke Road in Widnes in the north. Is the Silver Jubilee Bridge going to close? How do I find out more information about the construction and development of the project? If you don't pay by midnight the day after you cross you will get a Penalty Charge Notice (PCN). A PCN is a legal document, carries a fine of £40 or currency equivalent, and will be issued to home address of the registered keeper. This is reduced to a discounted rate of £20 (or currency equivalent) if it is paid within the first 14 days of being issued. For the following 14 days after the discount period has expired the PCN will be changed at full rate of £40 or currency equivalent. If the PCN has still not been paid after this 28-days period, then the fee that must be paid is increased to £60 or currency equivalent if it is paid within the following 14 days. Whatever penalty fee you pay, you will also need to pay the original unregistered toll fee in addition to the penalty fee. If the PCN remains unpaid beyond this 42-day period then the penalty will be registered as a civil debt and if unpaid after another 36 days, recovery action will begin. If you have received a notice relating to this toll and you would like further information, please Contact EPC. EPC currently administers the collection of outstanding toll fees issued to non-domestic registered vehicles for the Severn River Crossing and Humber Bridge Board.